The term “Charcot Foot” may be used to describe Charcot arthropathy or Charcot-Marie-Tooth disease. In either case, it is a deformity characterized by very high arches, hammertoes and a lack of muscle strength in the foot. The severity of the deformity varies depending on the stage of the condition. In the early stages, there may be mild swelling, pain or redness. The skin tends to feel hotter than normal, particularly around the joint. There may be numbness or tingling in parts of the toes or feet. X-rays are often ordered to determine the severity of the condition. Loss of bone can be recognized in an X-ray, which is a classic symptom of the degenerative condition. As the condition progresses, the classic deformities start to appear. Increased height of the arch is noticed. The toes start to turn outwards and eventually develop the “hammered” look. There is usually less pain than would be expected, considering the extent of the deformity and the increased pressure on sensitive areas of the feet. Doctors assume that the lack of pain is due to the neuropathy, fewer living nerve endings mean less pain. The underlying cause of Charcot foot in all cases is degeneration and deformity of the muscles, bones and joints of the feet. Nerve death causes a loss of sensation and the already weakened bones are subject to fracture and increased risk of other injuries. As the patient is unaware of the injury, due to lost sensation, the condition worsens over time and more damage occurs. What Can Be Done About Charcot Foot? The bad news is that the condition is usually degenerative. It gets worse as time goes by. The good news is that surgery is rarely necessary, as long as you wear good supportive shoes and check your feet often for injury. Wear slippers, even when indoors. Don’t go barefoot. Due to the loss of sensation, a tiny cut can cause an infection or ulcer. Podiatrists recommend socks without seams that provide additional support. Shoes made by Drew, such as Women’s Paradise, are also recommended. In the case of the genetic abnormalities, the only preventative measure that has been investigated is high doses of vitamin C. While the treatment is safe, the outcome of testing was not as good as the researchers expected. But, nutritional therapies are still recommended to help reduce the degeneration and bone loss. Moderate exercise and maintaining a healthy weight helps, too. In the case of diabetic neuropathy, maintaining healthy blood sugar levels is the ultimate goal. It is chronically high blood sugar levels that damage the nerve endings and lead to their death. 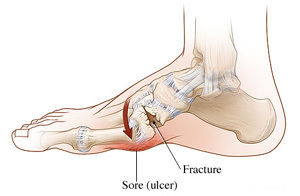 So, Charcot foot may be preventable and the progression of the disease can certainly be delayed.